Approximately 30 CBE members "Took Steps to End Homelessness" on Sunday, October 19, 2014 as part of a community fundraiser sponsored by Cornerstones. 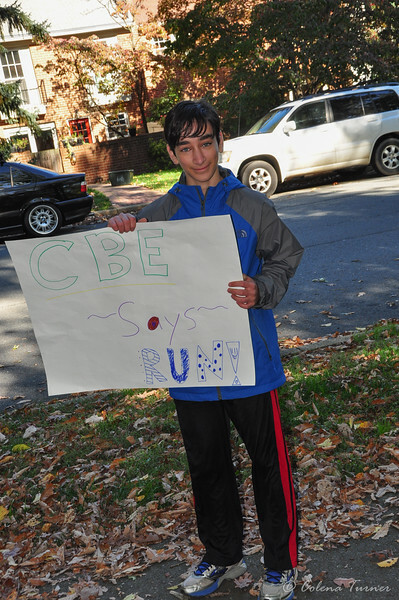 CBE's Chai School volunteers helped along the route for a Tikkun Olam project. - There are over 1700 homeless in Fairfax County. - In the Torah we are told to "walk in God's ways." We are also told repeatedly that God is gracious and compassionate, clothes the naked, feeds the hungry, etc. There is no better way to "walk in God's ways" than to participate in a "walk" designed to help others. Please join us as we participate in this wonderful mitzvah and emulate God's loving ways. Group photo by Colena Turner of Memories 4 U of Reston, other photos by Susan Berger and Ellen MacDonald.